Providing you the best range of hgm501 genset controller with effective & timely delivery. 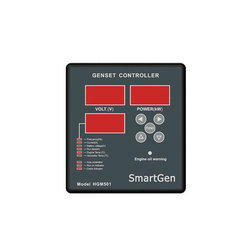 HGM501 gen-set controller is smart digital controller for control and protection of single-engine gen-sets. It can carry out start/stop, data measurement, alarm indication, shutdown protection and other functions. The controller is fitted with LED indicators; it is reliable and easy to use. HGM501 gen-set controller contains the microprocessor allows precise measurement of multiple parameters, which can be configured using controller front panel. With simple wiring, compact structure and high reliability, HGM501 can be widely used for data display and fault protection of a large number of diesel and petrol generator sets.